As they are located about 300-450km southeast of the main archipelago of Palau, the Southwest Islands are accessible only by private yacht or charter vessels. 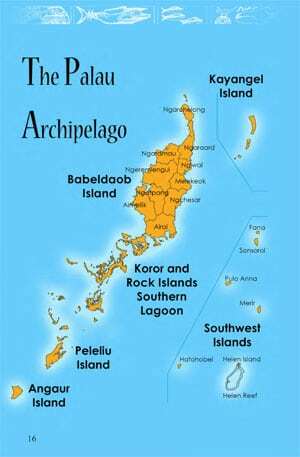 Peleliu and Angaur States are south of Koror and the Rock Islands, and are accessible by boat, helicopter, or small aircraft. In addition, regularly scheduled ferry service is available for a minimal fee. These famous mushroom-shaped jewels are accessible by most tour operators. The best way to see them is a boat ride on a Rock Island Tour combined with a stop at Jellyfish Lake. While the Palau International Airport is located in Airai State in Babeldaob, many of the hotels and resorts, as well as the tour operators are located in Koror. Babeldaob is joined to the inter-connected islands of Koror State by the Japan-Palau Friendship Bridge, and a sealed highway circles Babeldaob from both the east and west sides, up to the tip of Ngerchelong State. A coral atoll north of Babeldaob, Kayangel State is accessible only by boat charter or helicopter.